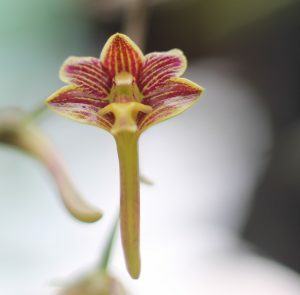 This delightful little dendrobium (the lute-shaped lip dendrobium) is native to Malaysia and South East Asia where it grows as an epiphyte in lowland forest from 250-600m altitude. It produces pendulous pseudobulbs and so we find it is well suited to a basket. The flowers form on short sprays from near the end of the pseudobulbs. The extremely long spur like mentum to carry nectar, and the red colouring both suggest that this species is bird pollinated. Thanks to Joe for the excellent photo.